The most important ingredient for our campfire pizza was pine mushrooms. We added water, oil and a bit of beer to a Ziploc bag of flour, salt and yeast and set it aside to rise. We had been told by a few trustworthy outdoor-types that pine is the easiest mushroom to identify. It has a distinct sweet piny scent, they said, and a large brown cap. You can’t miss them. Pretty quickly, we found a few patches around the hiking trail at Prelude Lake Campground, a half-hour’s drive outside Yellowknife. But as we picked, we questioned—sniffing out selections for that sweet pine smell and asking each other for second opinions. We felt less and less certain, dropping every new mushroom into our bags like we were shopping with a 30-day money-back guarantee. We drove further up the Ingraham Trail to Cameron Falls, a popular hiking and picnicking spot. We picked some more on the trail in and as we settled around the fire to build our pizzas, we assessed our take. We had a lot of… something. The specimens had a sweet but earthy smell and they had large brown caps with long, tapered white stems. We looked like we knew what we were doing. Or at least a couple of hikers from Alberta made us feel that way, remarking on how rugged we appeared, all dressed in plaid, cooking pizza over a fire at the edge of a river with cans of beer cooling in the water. Hiking boots had been shorn for bare feet and I had a few sticks holding up my curly hair. But here we were, daring ourselves to play a game of mushroom roulette. In the end, we didn’t. 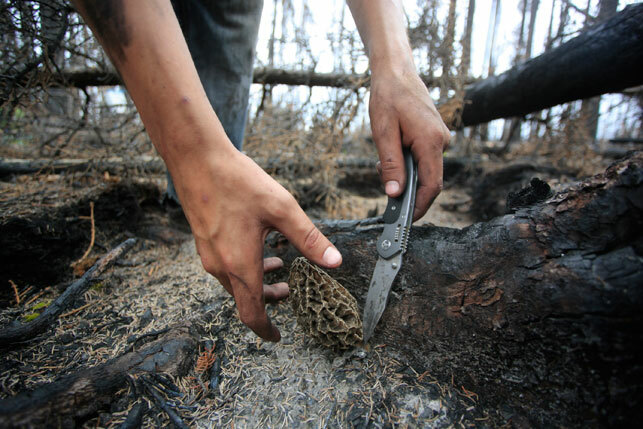 And that’s probably a good thing because when I asked one expert, Bruce Green of Hay River, NWT, about pine mushrooms, he said they’re not a great choice for beginner pickers. They can be tricky to tell apart from other tricholoma mushrooms. (He’s made mistakes himself—luckily, not with the poisonous variety.) When I asked Joachim Obst, another mushroom aficionado, he said to absolutely avoid pine mushrooms around Yellowknife, as they absorb toxins—arsenic from defunct mines and lead in particular—from the environment. 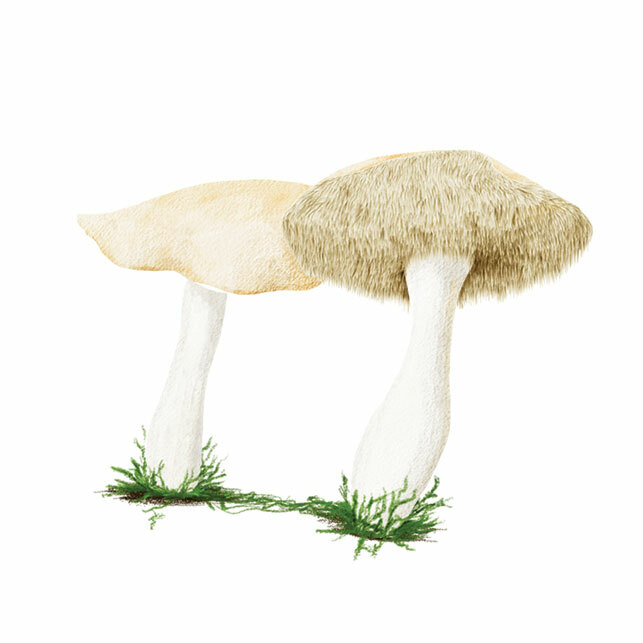 There are more than 200 varieties of mushrooms in the North. Some are edible; most are not. If you are thinking of heading out to pick, here are a few things to keep in mind to make it a positive, and non-life-threatening, experience. Remember, consult various sources—both human and field guides. And don’t take risks. 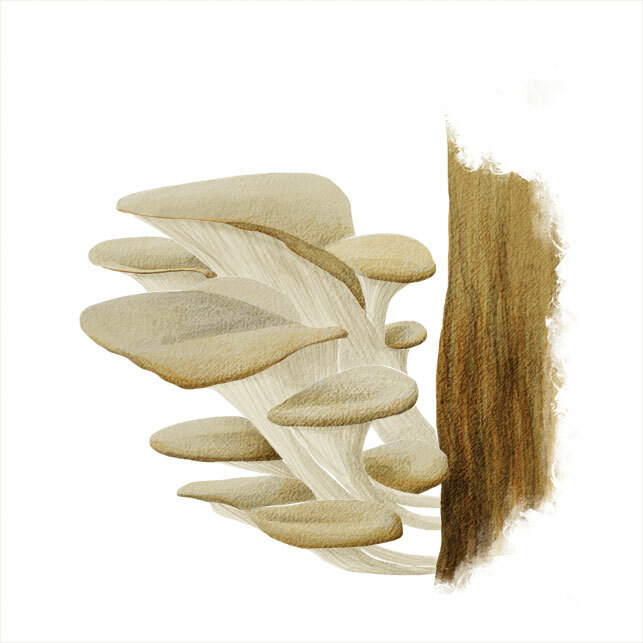 Fan-shaped and cream or greyish in colour, they grow in a shelf-like formation up the sides of dead or dying trees and tree stumps (mostly hardwoods like poplar) and have thin papery gills. The stalk is very small or absent completely and off-centre from the cap. Why we eat them: Their mild taste goes well alongside meat or seafood. 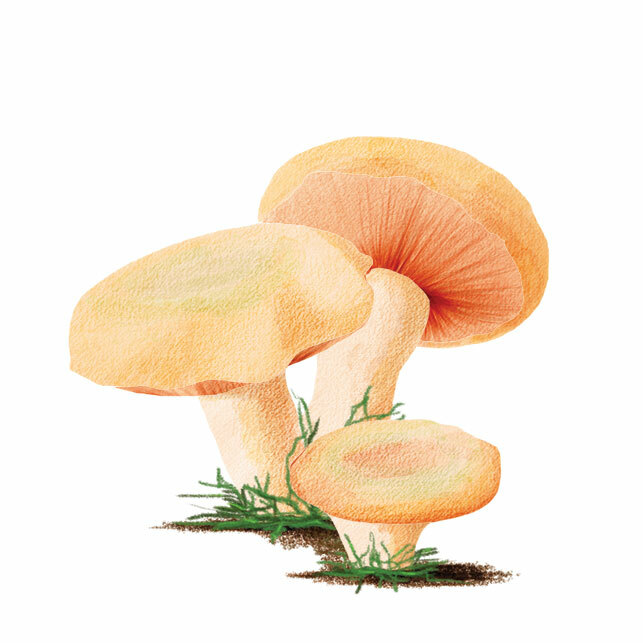 They have large orange-coloured caps that flip up at the edges and develop a tinge of green as they age or are handled. The gills are orange, papery and the flesh releases a neon orange fluid when it’s broken. Why we eat them: They hold up well when fried, maintaining some crunch. They don’t have a whole lot of flavour though. Warning: There are other varieties of milk caps that are poisonous, but this one is identifiable from the neon orange milk it oozes. The tall cylindrical cap is white, with scales that peel up and turn brown—appearing a bit like Marge Simpson’s hair. (Tousled, hence the name shaggy.) The stem is hollow and tends to thin out towards the top. They grow in clusters and the lower edge will umbrella open, its gills turning black and gooey—and unappetizing—over time. Why we eat them: The flavour isn’t terribly strong but has a slightly bitter edge. Some like it, some don’t. 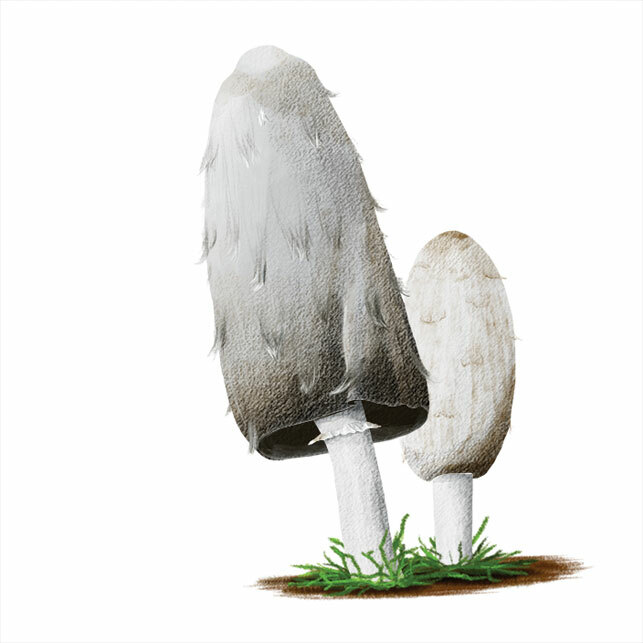 Think umami, says Skinner, who adds that Whitehorse chef Miche Genest dries and crushes shaggy manes over dishes, like a spice. Warning: If not dried, they need to be prepared (sautéed, for example) within hours of picking or they’ll turn inky. 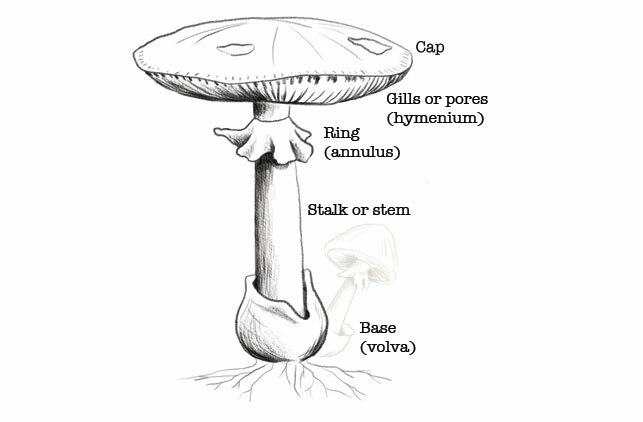 They have a large brown domed cap that becomes flatter with age, and a pleasant mushroomy scent. The fat stem can curve and it is veiled in white mesh. The small, tightly spaced pores are white, but will turn a murky green colour with age. Why we eat them: There’s a market for these overseas and some Dawson chefs are known to use them in seasonal dishes, says Skinner. 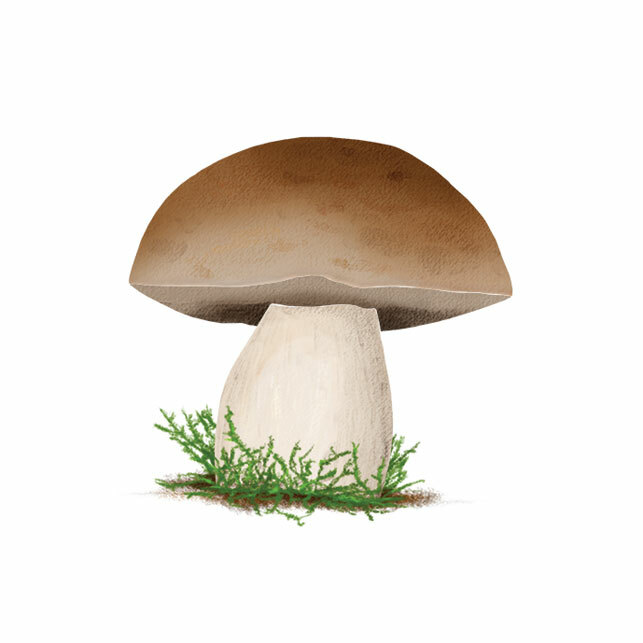 Warning: King boletes are also a favourite of insects and worms—make sure you beat them to it. Brown or caramel coloured, they are recognizable for their honeycomb cap, often with black-edged ridges. They are oblong, growing pointier at the tip through the season. The cap continues out of the stem and is attached completely, rather than hanging over freely. When to pick: Spring, especially May and into June. Later in the season, they harden into witch’s hats and aren’t great for eating. Why we eat them: They’re hearty, delicious and chefs around the world will pay a good price for them. They also keep well when dried. Warning: There are several examples of ‘false morels’ that look similar but can be poisonous, causing vomiting, diarrhea and in the worst cases death. 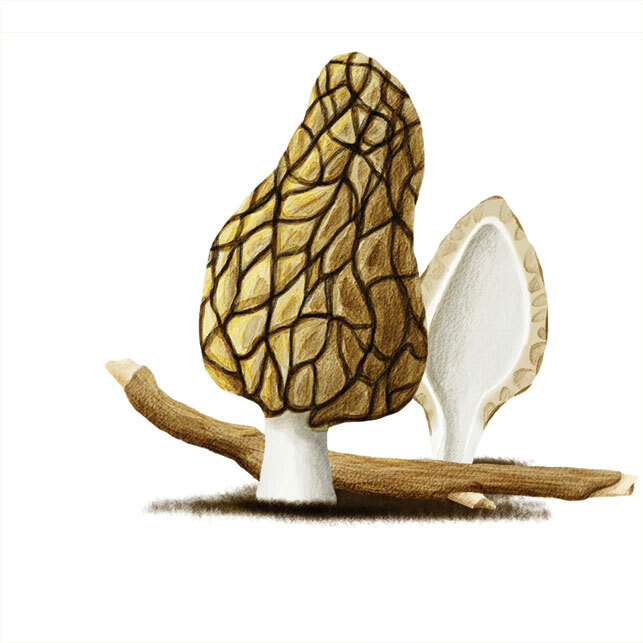 Become familiar with the distinguishing characteristics—false morels can have lobes or bulges along the cap and aren’t necessarily hollow, like true morels. Why waste the water? If you're soaking morels to rehydrate them after months of keeping, Skinner suggests cooking the replenished mushrooms into a risotto and using the remaining water you've soaked them in to flavour the broth. Closely related to chanterelles (and often found near them), these have an irregular-shaped cream or orange-coloured cap that can have various lobes. They have short and thick stems off-centre from the cap. Rather than gills, they have small teeth-like spines hanging under the cap. Why we eat them: They’re mild-tasting, but very firm and meaty. Warning: These mushrooms are hearty and great for cooking—just make sure not to singe the teeth with too much heat. They don’t dehydrate particularly well. It’s always best to go out with a guide. And to listen to them. Bruce Green led a group of adults on a mushroom identification course in the Hay River area. “I tried to point out very carefully which ones were toxic, potentially poisonous or safe,” says Green. Still, when he checked what everyone had collected at the end of the day, sure enough, a few baskets were brimming with the unsavoury sort. Start slowly. Sam Skinner suggests focusing on one or two species to really get comfortable, before moving on to others. If it smells unappetizing, don’t eat it. Bring a field guide or two. It’s always good to consult different sources. Skinner notes that different field guides can offer up different information. Eat with caution. Green says any wild mushroom should be cooked before it’s eaten. And everyone reacts differently to mushrooms, so don’t go binging until you’re sure your stomach can handle it. Drink alcohol with even more caution. Drinking and eating certain mushrooms isn’t advisable. Morels and inky caps like Shaggy Manes, for example, don’t mix well with alcohol. There have been cases of people consuming alcohol up to five days after eating inky caps and reporting their skin flushing, limbs numbing and heart racing. If you plan to have a drink with dinner, pick another mushroom.